This drink was created in 1970’s at the Aviary Bar in Kuala Lumpur. 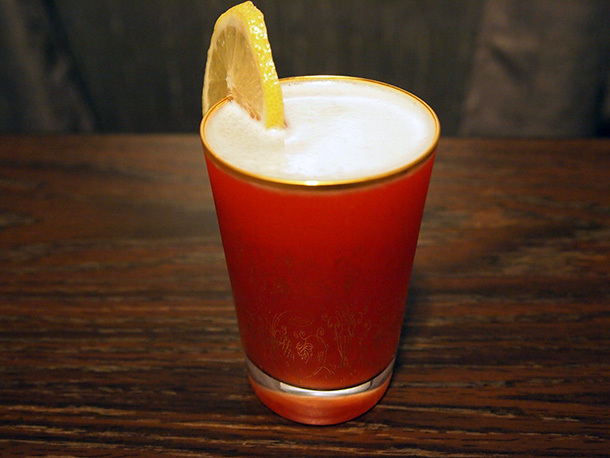 It belongs to a small and exclusive club of tiki drinks that call for Campari. This drink has strong flavors courtesy of blackstrap rum and Campari but it manages to make a winning and harmonious combination. Directions: Add all ingredients to a shaker, add ice, shake and strain into a chilled glass with fresh ice. Garnish with a lemon wheel. Notes: As you bring the glass to your nose you are greeted by the fresh scent of lemon. Upon drinking you get the rich molasses and coffee notes which provide a strong backbone to the drink. These dark flavors a brightened by the tart bite of lime and candied sweetness of the pineapple. Rounding it is the Campari which adds a great bitter note that helps to round out the whole drink. This is on my list of drinks to try out. I love Campari.